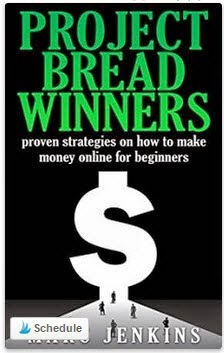 If you want to quit your job or circumstances have forced you out of your job and you need to make a living online, Project Bread Winners: Proven Strategies on How to Make Money Onlinefor Beginners by Marc Jenkins may be able to help you do just that. This book is a quick read, but it does contain information that will be enlightening to someone who is just beginning to make a living online. Chapter 8: Online Training and Tutorial Courses – The Most Powerful Earning Method Online Period! Marc Jenkins explains early on that he is nearly blind. He receives disability, but he wanted to work for himself, so he started working online. The book gives many strategies for making money online. Jenkins suggests determining what your potential customers want before starting your site so you can cater to them from the beginning. Before you can make any money, you must be able to lure your potential customers from big sites like Google, Facebook, and Pinterest to your site. Jenkins gives the primary methods of how to earn a living online through your own site. This book is a good primer for someone who has very little experience with running an online site and making money online. If you’re new to the online selling world and you’re not sure what people mean when they talk about affiliate marketing, CPM or CPC, this is a good book for you. Jenkins does share some good ideas for drawing traffic to your online training and tutorial courses, and he gives a good, general overview for making money through YouTube videos. The major drawback I see is that there are many typos that can prove distracting. I’m a bit easy on this because Jenkins’ disability may very well be the cause of these. However, a good editor would have been appreciated. Additionally, for curiosity’s sake, I would like to know how Marc Jenkins makes his money online. Which of the strategies does he use? Which does he find most profitable? If you’ve had your blog for six months or more, you will likely know most of the information shared in this book and may find very little value unless you’re branching out to a new arena like making money from YouTube or from developing your own courses.